You can redeem your UCount Rewards points for Fuel at Caltex. All you need is your Business Rewards Card and Pin. 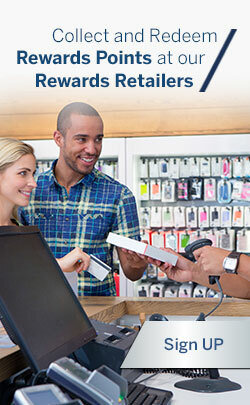 You can redeem your rewards points for great deals at our Rewards Retailers using your Business Rewards Card and Pin. From local flights, to car hire and accommodation, you will get great business travel deals at the UCount Rewards Travel Mall! From office supplies and electronic equipment to event planning and entertainment options, you’ll get it all at the Online Mall! Plus, we’ll deliver direct to your offices. Use your rewards points to add to your savings in a Notice Deposit account. You can put your Rewards Points to good use through our crowd-funding initiative. This initiative relies on the collective efforts of a group of investors, from large corporates to individual philanthropists, to reach specific funding goals. You can Donate to a student through our Crowd Funding initiative on the Feenix platform. Pay for your lounge visit at any domestic or international lounge in South Africa using your Business Rewards Card and Pin. At any of our Rewards Retailers, Bidvest Premier Airport Lounges or for fuel at any Caltex, simply swipe your activated Business Rewards Card and enter your PIN. Simple as that. Call us on 0860 UCOUNT (82 68 68) and one of our friendly agents will gladly help you with your online redemption. And remember, everything that is available at the UCount Rewards Online Mall and Travel Mall is also available via our Contact Centre. Once you have decided on your purchase, simply proceed to the checkout and follow the easy steps to redeem your rewards points and make your payment. And remember – if you don’t have enough rewards points, you can pay the difference using your qualifying Standard Bank Business Credit or Cheque Card. If your business has a Notice Deposit account, you can redeem your rewards points into the account and add to your investment. If you don’t have a Notice Deposit account yet, you can open one at any Standard Bank branch or online via Internet Banking. You can redeem your rewards points online or by calling the UCount Rewards contact centre on 0860 UCOUNT (82 68 68). Time is a valuable commodity – especially when you are running a business. That’s why it makes sense to book your business trips through the UCount Rewards Travel Mall. Redeem your points for local and international flights and collect up to 40% back in rewards points. Depending on your rewards tier, you will receive an instant discount of 15% on all international flights booked with Etihad Airways. You can also book accommodation at a range of hotels, guest houses and B ’n B’s around the world – and get a 10% discount on your car hire from Europcar! 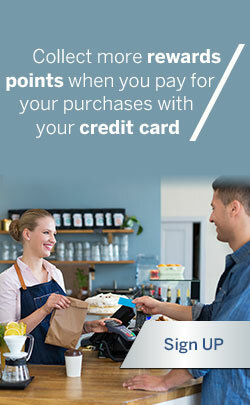 Plus, you will collect up to 1.25% back in rewards points just for using your card! IMPORTANT: Only the Transactor (the signatory who registered on the business’s behalf) may manage the account and redeem rewards points for flights, car hire, hotel accommodation and travel packages. When redeeming rewards points, the Transactor of the account has the option to make bookings on behalf of other members of the business. Plus – get AUTOMATIC travel insurance! Travel insurance is a must have – so all travel tickets purchased with your Business Credit Card are automatically covered with FREE basic travel insurance. We can also assist you with additional top-up insurance should you need it. Click here to view our travel insurance Terms and Conditions. REMEMBER: All Standard Bank Business customers can benefit from the deals we have negotiated for the UCount Rewards Travel Mall, but as a Business rewards member you also collect up to 40%* back in rewards points! You will receive a Business Rewards Card which can be swiped by the Transactor in-store at any Rewards Retailer to pay for your purchases. Your Business Rewards Card can also be used to pay for fuel at Caltex, or to visit a Bidvest Premier Airport Lounge. To redeem your rewards points in-store at any of our Rewards Retailers, Bidvest Premier Airport Lounges or for fuel at Caltex, simply swipe your activated Business Rewards Card and enter your PIN. Simple as that. You can also use your Business Rewards Card online to redeem your points and pay for your purchases at our online Rewards Retailers. NB: Your UCount Rewards Card must be activated in order to retrieve your 3D Secure Code. If you haven’t yet activated your UCount Rewards Card, you can do this online, or by calling the UCount Rewards contact centre on 0860 UCOUNT (82 68 68). If you don’t have enough rewards points, you can top up and part pay using your qualifying Standard Bank Business Credit, Cheque or Debit Card. Or, if you’ve redeemed all your rewards points and want to buy from the UCount Rewards Online Mall or Travel Mall, you can pay in full using your Business Credit, Cheque or Debit Card. For your protection, you can only redeem a maximum of R30 000 worth of rewards points a month on your Business Rewards Card. Rewards points can only be redeemed at the Rewards Retailers, Caltex, Bidvest Premier Airport Lounges, the UCount Rewards Online Mall and Travel Mall, or through the UCount Rewards Contact Centre. Rewards points can only be redeemed at participating Rewards Retailers, Caltex forecourts, Bidvest Premier Airport Lounges in South Africa, on the UCount Rewards Online and Travel Mall or through the UCount Rewards Contact Centre. Remember: if you don’t have enough rewards points, you can always part-pay using your qualifying Standard Bank personal Credit or Cheque card. Or if you’ve redeemed all your rewards points and want to buy something else from the UCount Rewards Online and Travel Mall, you can pay in full using your qualifying Standard Bank card. Need fuel, a snack or a place to relax before a long flight? Simply swipe your activated UCount Rewards Card to redeem your rewards points at any Caltex forecourt, participating Rewards Retailer or a Bidvest Premier Airport Lounge in South Africa. The UCount Rewards Online Mall offers a fantastic range of products and services at great prices. From kitchen appliances and electronic equipment to spa treatments, airtime or magazine subscriptions, our handpicked products and services offer a range of items that will get your pulse racing. Browse the various lifestyle categories, or use the search functionality to find a particular item that you have your heart set on. If you don’t have enough rewards points yet you can pay the difference using your qualifying Standard Bank personal Credit or Cheque card. Plus – we’ll deliver to your door! UCount Rewards will securely deliver your purchases directly to your door. If your item is a gift, simply enter the address of the person you would like to have it sent to and we’ll take it from there! You can also use your rewards points to pay the delivery fee. So join UCount Rewards today and enjoy even bigger savings! 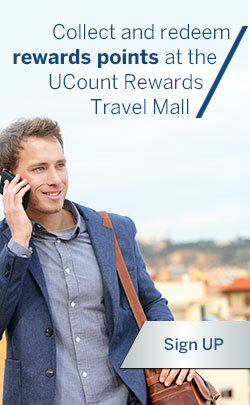 Fly even higher with Avios and UCount Rewards! As a UCount Rewards member you can jet off to exciting destinations worldwide by converting your rewards points to Avios* with the British Airways Executive Club or Avios Travel Rewards Programme. You can use your Avios for local and international** flights. 2 rewards point is equal to 1 Avios 4500 Avios is equivalent to a one way flight to Durban, Harare, Livingstone, Port Elizabeth or Victoria Falls from Johannesburg. Converting your rewards points to Avios is easy! When you want to convert your points, just call the UCount Rewards contact centre at 0860 UCOUNT (82 68 68), or visit the Adventures and Travel section on the Online Mall, click on ‘ Avios’ and follow the easy steps. Remember to keep your British Airways Executive Club or Avios Travel Rewards Programme membership number handy. Not a Programme member yet? If you are not yet a member of the British Airways Executive Club, you can log on to www.ba.com and click on the ‘Executive Club’ button to enrol. Alternatively, call the Executive Club Contact Centre directly on 011 441 8500. If you would like to join the Avios Travel Rewards Programme, you can log on to www.avios.com and click on the ‘Join now‘ button to enrol.Alternatively, call the Avios Travel Rewards Programme directly on 0860 028 467. *Once UCount Rewards members convert their rewards points to Avios, Avios Travel Rewards Programme and British Airways Executive Club terms and conditions relating to Avios will apply. British Airways Executive Club terms and conditions can be found at www.ba.com. Avios terms and conditions can be found at www.avios.com. These terms and conditions may be amended from time to time. ** Airline taxes, fees and carrier charges are payable in Rands and all bookings are subject to availability and to Avios and its Carriers’ terms and conditions. If you don’t already have a Tax Free Investment Account (TFIA), you will first need to open one via Internet Banking by clicking on the ‘Tax Free Investment Account’ tab or through the Standard Online Share Trading (OST) platform. Once your account is opened, you will be able to redeem your rewards points* and add to your investments! There is a R30 000 annual contribution limit and a R500 000 lifetime contribution limit. Selected Exchange Traded Funds (ETFs) are suitable. You select the listed securities you would like to invest in, with a minimum of R250 per instrument. You can view your portfolio online through your Standard Bank Internet banking profile. Profits made in the TFIA account do not contribute to existing tax annual limits (interest and capital gains), and may be re–invested in the TFIA without utilising the contribution limit, provided they are not withdrawn. There are penalties for exceeding the R30 000 annual contribution limit. When you open a TFIA you will benefit from SBG Sec’s reduced brokerage rate of just 0.25% (excluding statutory charges#). Once your Tax Free Investment Account is opened, you can redeem your rewards points either online or by calling the UCount Rewards Contact Centre on 0860 UCOUNT (82 68 68). *IMPORTANT: The minimum amount you can redeem into an AutoShare Invest account is 2 500 rewards points (R250). Redemptions have no limit, but must be in increments of 2 500 rewards points (R250). #Statutory charges include STRATE, Securities Transfer Tax (STT), Investor Protection Levy (IPL) and VAT. If you don’t already have an AutoShare Invest (ASI) account, you will first need to open one via Internet Banking by clicking on the ‘AutoShare Invest’ tab. Once your account is opened, you will be able to redeem your rewards points* and add to your investments! A choice of around 200 well–known Securities in which to invest. You select the Securities you would like to invest in, with minimum of R500 per selected Security per month. When you trade on ASI you will benefit from SBG Sec’s reduced brokerage rate of just 0.25% (excluding statutory charges#). The performance of each Security. Background information on each Security. If you don’t already have a Notice Deposit account, you will first need to open one at any Standard Bank branch, via Internet Banking or by completing an application on the Standard bank website. Once your account is opened, you will be able to redeem your rewards points* and add to your savings! Once your Notice Deposit account is opened, you can redeem your rewards points either online or by calling the UCount Rewards Contact Centre on 0860 UCOUNT (82 68 68). Go further with SAA Voyager and UCount Rewards! As a UCount Rewards member you can turn your travel dreams into reality by redeeming your rewards points for SAA Voyager Miles* any time you want to fly! Your rewards points are a great way to boost your SAA Voyager Miles before they expire – and you can use them to travel to any SAA destination, locally, regionally or internationally! Remember: 1 rewards point is equal to 1 SAA Voyager Mile – so the more points you collect, the closer you’ll be to seeing more of the world – courtesy of SAA Voyager and UCount Rewards! Redeeming your rewards points for SAA Voyager Miles is easy too! When you want to redeem your points, just call the UCount Rewards contact centre at 0860 UCOUNT (82 68 68), or visit the Adventures and Travel section on the Online Mall, click on ‘SAA Voyager’ and follow the easy steps. Remember to keep your SAA Voyager membership number handy. Not a Voyager member yet? If you are not yet a member of SAA Voyager, you can log on to www.flysaa.com and click on the ‘Join Voyager now’ button to enrol. A Voyager Number will be issued immediately and a secure pin will be emailed /texted to you. *Once UCount Rewards members convert their rewards points to SAA Voyager Miles, SAA’s terms and conditions relating to SAA Voyager Miles will apply. SAA’s terms and conditions can be found on www.flysaa.com. These terms and conditions may be amended from time to time by SAA Voyager at its sole discretion.